Established in 1744, Sotheby‘s auction house has been a leading marketer of the world‘s most valuable objects for centuries. And since 1976, that expertise has extended into real estate, where Sotheby’s International Realty has sold many of the world‘s most extraordinary properties. With an international network of 880 company-owned and affiliated brokerage offices and over 22,000 agents in 72 countries combined with the Sotheby’s auction house locations. Sotheby’s International Realty is the only residential brokerage and marketing firm with a true worldwide presence. The same tools and techniques that we have developed for selling trophy properties have proven equally effective for selling important new luxury developments. To continue our tradition of leadership in the luxury market, Sotheby’s International Realty Development Advisors was formed to provide best-in-class sales and marketing services for the most extraordinary new developments in New York City and beyond. Our qualified team of industry professionals serve as dedicated partner throughout the life cycle of a project. We leverage our extensive network of sales experts and proprietary channels to execute intelligent, innovative and strategic sales and marketing programs. Our unique platform provides privileged access to our qualified global client base and unparalleled exposure for the new developments we represent. Consulting - From pre-development consultation on unit mix and working with architects on design selections to market research and re-positioning, we help developers unlock value. Strategy - We synthesize information from research, sales and marketing so that developers can make informed decisions to maximize returns and sales velocity. Marketing - In addition to managing third-party branding and PR agencies, we collaborate with our in-house marketing teams, global referral network and with Sotheby’s Auction House to provide targeted exposure developers can‘t find anywhere else. Project Management - Decades of experience working with developers has taught us how to execute on great ideas and provide sophisticated status reporting so that you know where we are and where we‘re going until the last unit is sold. We invite you to connect with us or inquire below to learn more about our full suite of new development sales and marketing services. Please direct all press inquiries to Director of Public Relations, Kristina Helb at kristina.helb@sothebyshomes.com. 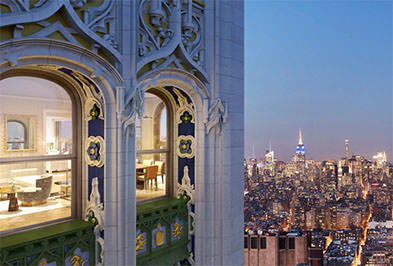 Sotheby’s International Realty has a successful history marketing luxury, branded residential new development products that achieve record sales prices including Madison Equities’ 212 Fifth Avenue, Alchemy Property’s The Woolworth Tower Residences, Macklowe Properties’ 737 Park Avenue, Alloy Development’s One John Street, Property Markets Group and JDS Development Group’s Stella Tower, and Axia Realty’s 40 East 72nd Street.